We often get the question, "What is that?" from our patients who are watching us wave this "blue wand" over their mouth while getting fillings. This "blue wand" is a curing light. This light is used for polymerization of light-cured resin-based composites or, in other words, the white filling that we put in a tooth. There are several materials that are curable by light. These lights can be Tungsten halogen, LED, plasma, and laser. Halogen and the LED are the most popular. 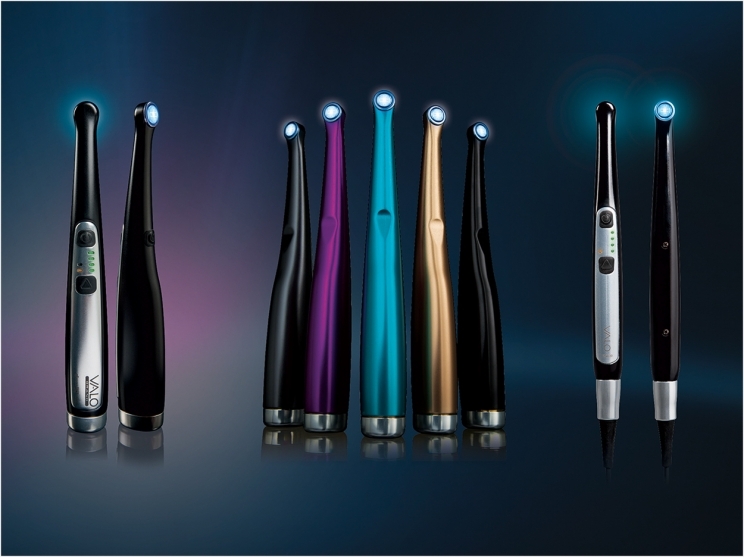 A dental curing light that hardens a white tooth colored filling. In the 1960's the first light-cured resin composite was developed. This led to the first curing light. They called it the"NUVA." The NUVA used ultraviolet light to cure composites. It was discontinued due to lack of shortened wavelength curing into the resin. Advances were made in the 1980's in the areas of making visible light curing.This next type of light was the halogen bulb. This light had further penetration and replaced the UV light. Areas of improvement took place in the 1990's. Resin composites were better and the lights became stronger. The plasma light was introduced in 1998. It was a high-intensity light with a fluorescent bulb claiming to cure in 3 seconds. There were negative aspects to this light: high priced, actually cured in longer times than 3 seconds, and it was expensive to maintain. This brought about another light source technology. 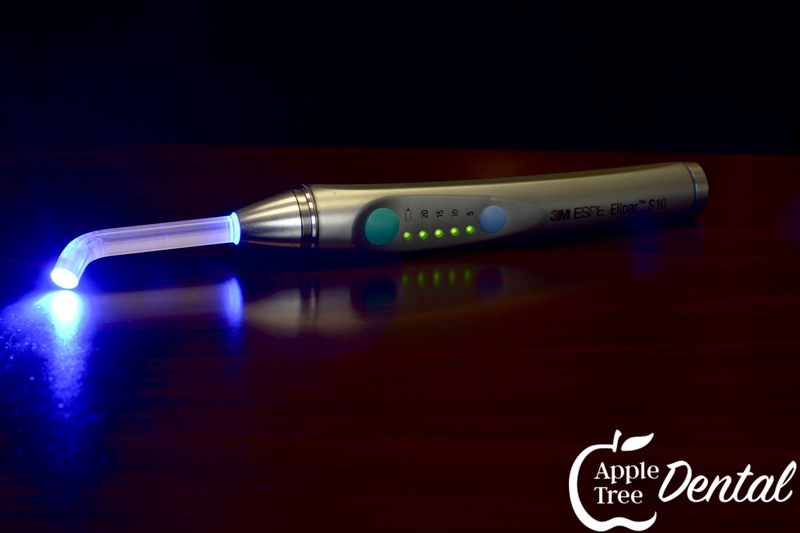 Our curing light used at Apple Tree Dental in Rexburg, Idaho. Today we use the LED light. While the LED lights have been around since the 90's they weren't widely used until the frustrations of the plasma lights were unbearable. LED lights are continually being developed. 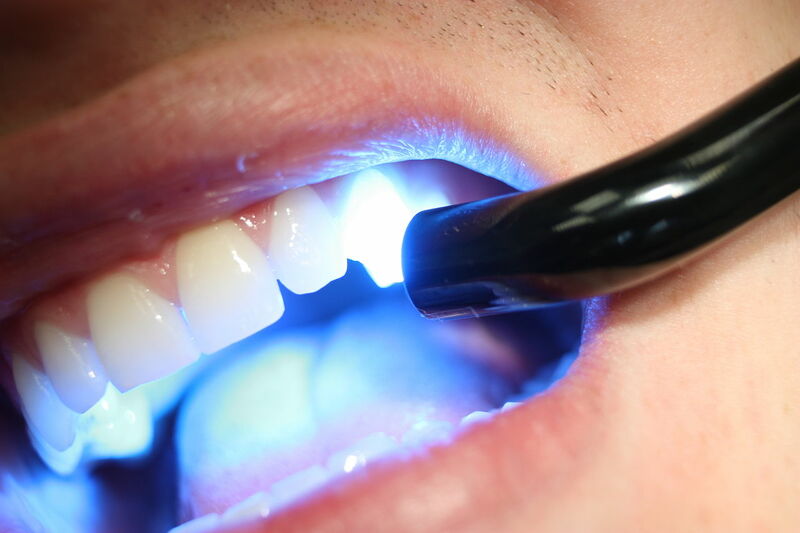 Dental curing lights only work on resin composite filling. They are not used for silver fillings, otherwise known as amalgam. So what is the difference between a resin composite restoration and an amalgam (silver filling) restoration? What are the benefits of each? 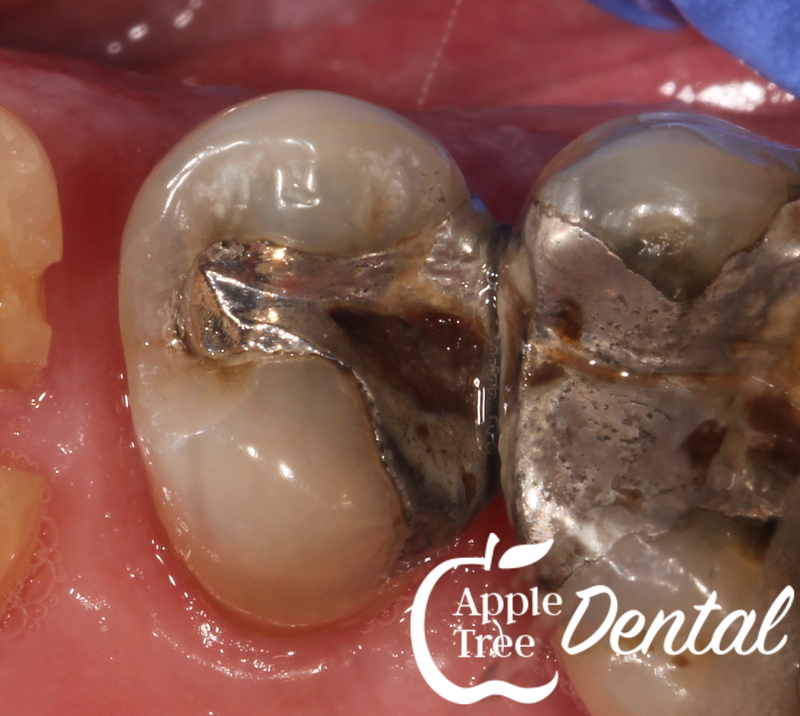 The most obvious difference between the two is that an amalgam (silver filling) is not good at hide-and-seek when looking in the mouth, while resin composite can be undetectable to the untrained eye. Thus, for esthetic purposes, many patients opt to use a more organic look for their filling material. In comparison, amalgam restorations have benefits of their own. Amalgam fillings have been used for over one hundred and fifty years and have (according to one study) been found to be more durable on wear and have greater longevity compared to composite fillings (https://www.ncbi.nlm.nih.gov/pmc/articles/PMC3011298/). While the Amalgam fillings may be considered more durable against wear and tear, they have a tendency to cause leakage into the tooth structure, which will result in tooth discoloration. It's common for more than 90% of amalgam fillings to have decay underneath them! Another hang up for people with amalgam fillings is attributed to the mercury content within the material. 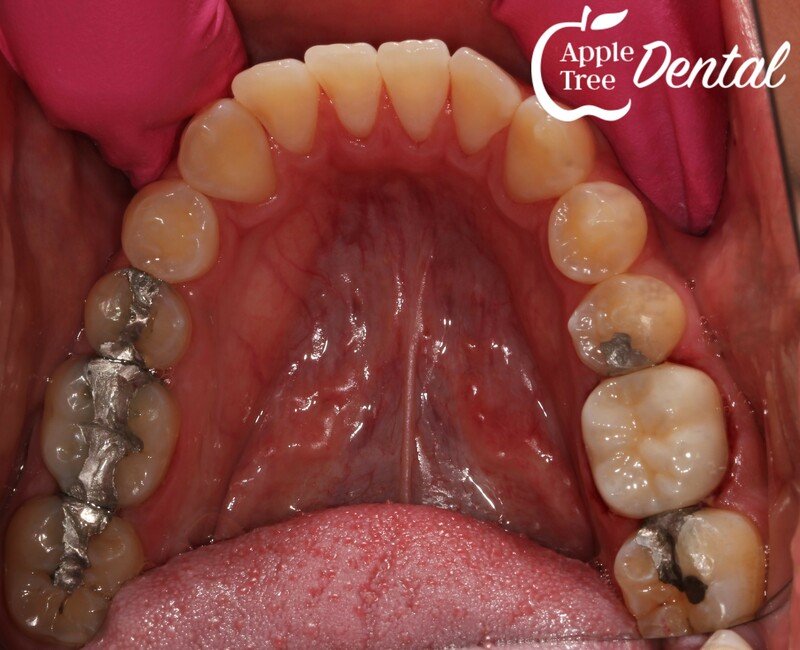 This scares many people away from having an amalgam filling. It's important to note that there are different types of mercury: elemental, organic, and inorganic. The mercury used in amalgam fillings is safe and harmless. Old amalgam filling with leakage and decay around it. Another problem with amalgam is that it is a metal. It contracts and expands when it is cooled or heated. That same expansion and contraction happens in your tooth as the mouth is heated or cooled. Consider what you eat and drink on a daily basis. You may have ice cream that is freezing cold and later be enjoying a boiling hot soup. Tooth structure is very glassy, so its easy to imagine how that much expansion and contraction stress can cause fractures over time. Not only do fractures occur, but during these expanding motions, the filling gives room for leakage and decay to grow underneath and can lead to more invasive treatment if not detected in time. 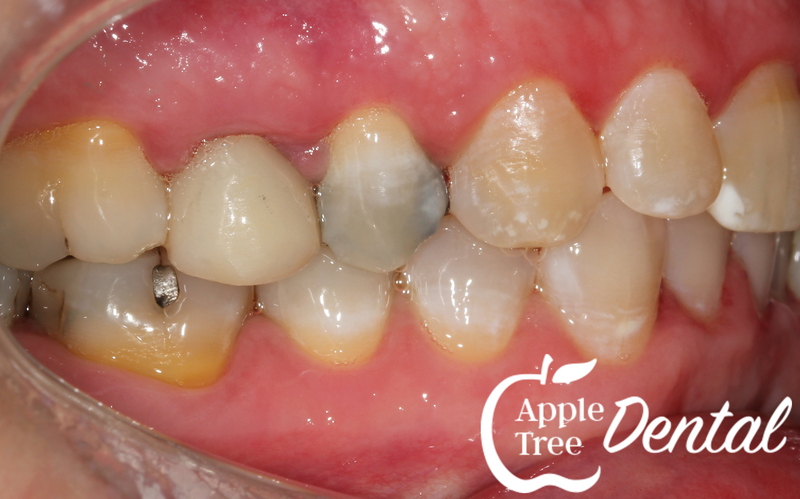 Darkening of the teeth due to old amalgam fillings. Like most dental offices, we don't use amalgam in our office. This is another way we give our patients the best quality and care we can offer. That's the Apple Tree Dental way here in Rexburg, Idaho: Extraordinary Integrity, Care, and Comfort!